I'm so very happy to announce that Anne, who bought the stuffed cactus from my store, Green Owl Crochet, really likes the cactus I made for her. She even left a stellar review for my store. Thank you, Anne! In related news, I crocheted a pair of earrings and a patriotic lanyard. I'll soon be making more earrings. 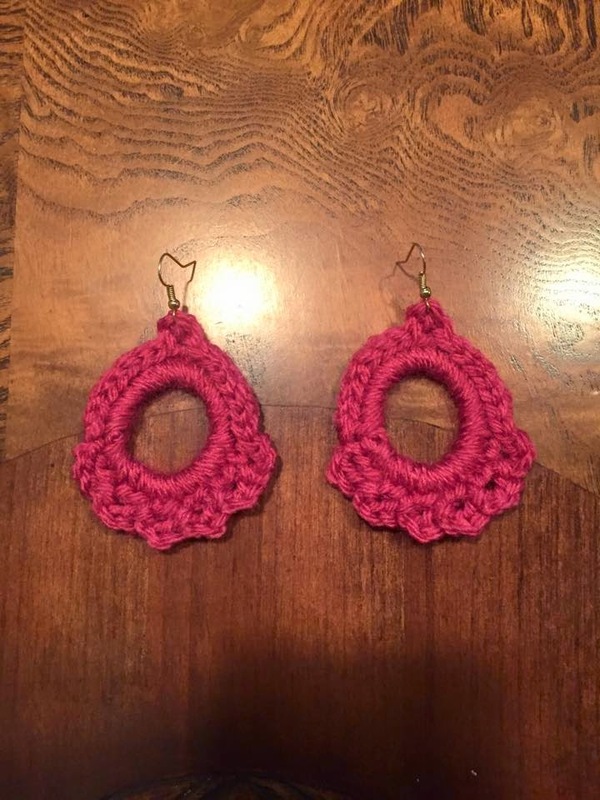 I bought some of Lion Brand's "Vanna's Glamour" yarn so I can make a pair of earrings with fancy metallic yarn. Right now, however, I'm working on crocheting hats and mittens for some folks who are homeless. 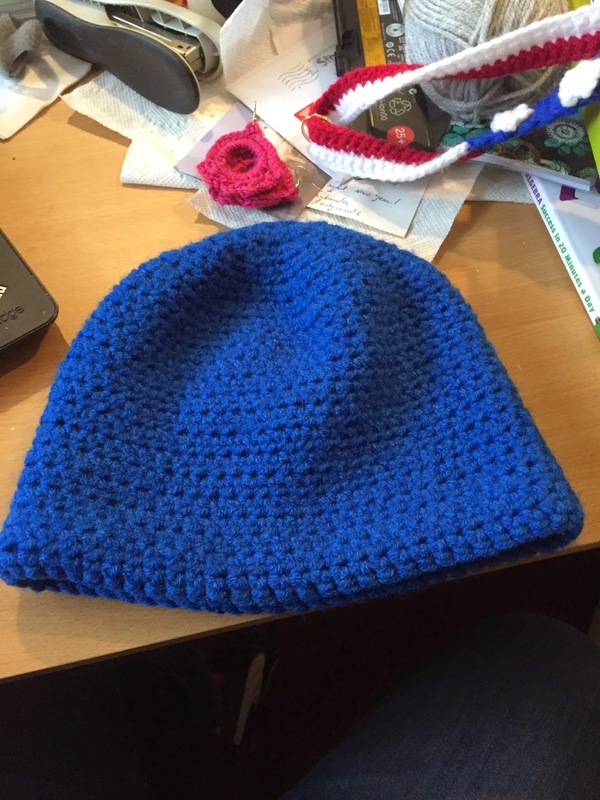 So far, I made one blue hat and I'm halfway done with a red hat. They are made with bulky yarn, so they'll be nice and warm. Review of "The Artist's Library"
I found out about the book called The Artist's Library while browsing for books on Amazon. Amazon suggested this book for me because I had viewed a book called Bibliocraft by Jessica Pigza (Pigza is a crafty librarian who also wrote the introduction for The Artist's Library). Based on the title and the synopsis, I immediately knew that I had to check my local library system (the Bergen County Cooperative Library System) to see if they had the book. To my great fortune, they did, and I so I requested it through the Inter-Library Loan. You see, if I were able to finish college and then go to graduate school, I would certainly look into becoming a librarian. However, even though I cannot finish the academic requirements to be a librarian, I still enjoy reading about libraries and librarianship. So, a book that combines libraries and the arts? Yes, please! The Artist's Library started off as a blog called The Library as Incubator Project. It's a great blog, but I hadn't heard of it before checking out The Artist's Library. The authors of The Artist's Library, Laura Damon-Moore and Erinn Batykefer, also created the blog (along with Christina Endres). I highly suggest you check out their blog, especially if you're not sure if you should buy The Artist's Library. The Library asIncubator Project shares many stories of artistic folks using their community's libraries in creative ways. This is basically about which the book aims to give suggestions. The Artist's Library, however, is much more straight-forward with their tips and instruction, and also contains fun exercises. The drawback to the book versus the blog is that the book only contains a few of stories shared on the blog. I'd recommend The Artist's Library to any artist, and especially artists living in the USA and other countries that have a solid system of free, public libraries. By the way, when the authors say “artist”, they're including a broad range of people, including musicians, actors, painters, poets, and the like. They are not only talking about professional artists, either. I found much of the advice helpful, even though I could be described as a hobbyist. The book gives you many suggestions on how to utilize the free resources available in libraries. The authors mostly focus on public libraries, but some of the advice can apply to other types of libraries you have access to, as well. For example, The Artist's Library gives you advice on how you can pitch a program idea to libraries so you can organize programs alongside librarians. I found The Artist's Library to be a fun and eye-opening guide. It's chock full of useful advice for artists, whether they be professionals or not. If you've ever wondered what your library has to offer you as an artist, The Artist's Library will provide you with ample tips and examples.